Participant Observation – what effect did I have? Can’t decide on a research topic for your post-doc? Yeah, me neither. The following is a repost of a blog written a while back that describes the process of creating, then publishing,’On a Train from Morgantown: a film script’ in Psychological Studies, an academic journal. More than ten years ago now, when I was living in a bedsit in Leicester and had just finished my PhD, I decided to write a conference presentation about Ken Gergen and Klaus Riegel. Both scholars played important roles in the development of my thinking for my PhD thesis (Narratives of Identity & the Informal Care Role). During this time I came across a volume (Life-span Developmental Psychology Dialectical Perspectives on Experimental Research, edited by Nancy Datan & Hayne W. Reese, published by Academic Press 1977) that was a result of the Fifth West Virginia University Life-Span Developmental Psychology Conference held at Morgantown, West Virginia in 1976. The conference centred on the work of Riegel and the book included a chapter by Gergen.My imagination got the best of me. What if these two, both influences on my own work, had a conversation following that gathering? As I recently explained, reported in a Times Higher Education article, “Gergen is a giant to our generation, so it was good to look back to a time when he was insecure…I wanted to examine how breakthroughs come, and the price people pay for them”. Thus, “On a train from Morgantown” was born.It seems a short time ago now, but we must not forget that in 2001 digital production was limited, at the personal computer level at least. I found video-cassette recorded footage of trains that would have been in service in West Virginia in 1976 then convinced a techy at my university to help me cut and edit it. I wrote a script (much like a radio play) and found people to record it on cassette tape (one in Germany, the rest in Leicester). I produced overhead projections for some of the visuals and created lots of sound files and edited music (again, on cassette) to fill out the imaginary train journey. I packed up all these production materials and caught the ferry to Hamburg and then a train to Berlin and a conference at the Free University to present my grand production … to an audience that would include Mary and Ken Gergen. When my allotted time came, I spent it dashing about starting up a TV, co-ordinating a cassette player, an overhead projector, etc.—a bit like the Wizard of Oz behind his curtain. Ken Gergen responded quite emotionally following all of this. The mostly German-speaking audience seemed a bit confused by it all. I recall this as a bit of madness on my part at the time, but also in many ways as the public birth of Performative Social Science, or at least the seeds for its future development. Being a visual person, I wanted to ‘show’ as well as ‘tell’–and this frustration became central to my efforts in developing a Performative Social Science (PSS). Because publication is (is supposed to be?) the end-all of some academic lives, I began to think about how to possibly publish ‘Morgantown’. Because of my visual inclinations, I thought that a film script with all of its optical instructions might do the trick. 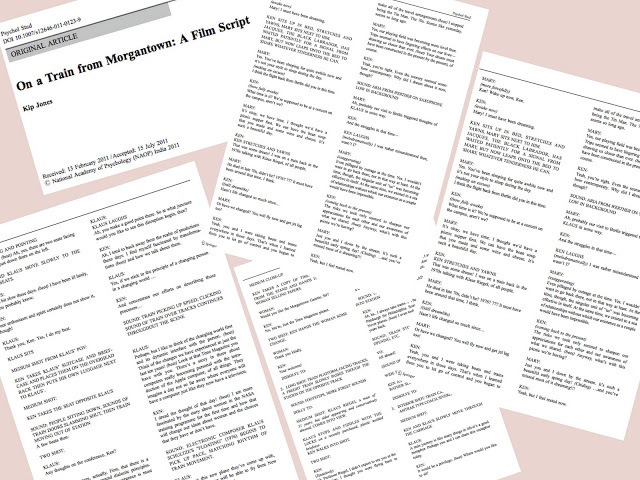 So I wrote ‘Morgantown’ up as a screenplay, looking at many scripts in order to get a sense of how to present a visual story as text. A bit of a Pollyanna at publication at that time, I actually submitted the script to a few journals which I naively thought might be adventurous enough to publish it. They were not and it was rejected. I put ‘Morgantown’ in a drawer somewhere and so it languished for almost a decade. About a year ago, the editor of a special issue on the work of Ken Gergen for Springer’s Psychological Studiescontacted me and asked if I would be interested in submitting a paper for the issue. I responded that, yes, I do have something that may be fit for purpose. Go ahead, I told myself: ‘I dare you.’ I submitted the script for ‘Morgantown’. To my great surprise, the submission was accepted with no substantial changes and now is published as a film script in the special issue on Ken Gergen in Psychological Studies. In my estimation, this represents a great breakthrough for Performative Social Science, or the use of tools from the arts in dissemination of social science research. It gives others a reference in support of their own work in moving academic publishers to being more open, even inviting, to alternative presentation formats. ‘Morgantown’ and its eventual acceptance holds a special place for me. In so many ways it represents ‘working in the dark’ against unknown forces and circumstances, but still being driven by our muses to create and invent. ‘Morgantown’ represents what I like to call ‘kitchen sink’ work—work produced because creativity compels us to find the means, the ways, the materials and then the outlets. This mirrors the way in which artists frequently work–something that social scientists and policy wags can learn a great deal from. The artist does not wait for someone, somewhere to establish a ‘cultural value’ for their outputs. They create and damn the consequences! I never want to forget that it is in these personal efforts the potential to make a difference lies. · Congratulations. This is really amazing. Thank you for your courage. And for the work that you are doing for all of us. · It’s just wonderful to see the glimpse of barriers breaking down between interdisciplinary research and innovative work. Well done!! It is happening a step at a time and we just need to keep on pushing those boundaries. · I got very inspired, though, when reading about your publication as I share PSS’ engagement and ambition to intensify publications moving in between arts/social sciences/performance …I say/shout “GREAT!! 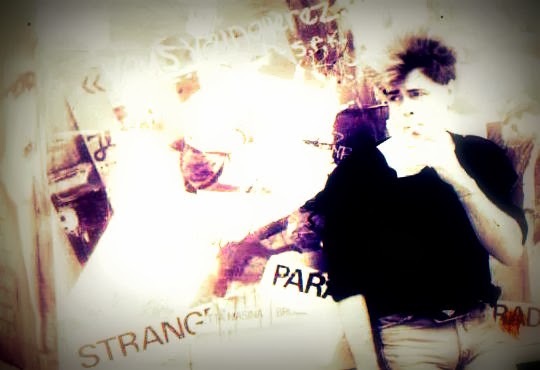 !” from Copenhagen! Thank you for sharing!! · I continue to watch your career with great interest and derive much hope for my own work from your example. · Think it is really important to share this kind of news as it gives all of us who research in creative ways hope! · A massive achievement in the current climate! · This is fantastic … and I received this just perfect for our course in qualitative research methodologies where I am teaching narrative and performative approaches. Will use your article as a brand new example and hope to encourage some of our students to be more daring!